With a bit of universal belt-tightening thanks to the global economic slowdown, many people seem to be spending less, preferring nights in rather than trips to the cinema, focusing on bargains in the stores and generally being smarter with money. Gone are the days of guilt-free shopping, where a mistake in the supermarket aisles would lead to nothing more than a wry smile and a return trip; instead, these days we’re often keeping a very close eye on what we buy, when and for how much. Keeping on top of expenditure and keeping tabs on your income might sound like a dull use for a mobile phone, but there are plenty of apps that can facilitate this, making it an easy task to forget the complicated spreadsheets on your desktop computer and use a mobile app. The following selection of money management apps for Windows Phone 7 can be acquired exclusively via the Windows Phone Marketplace. 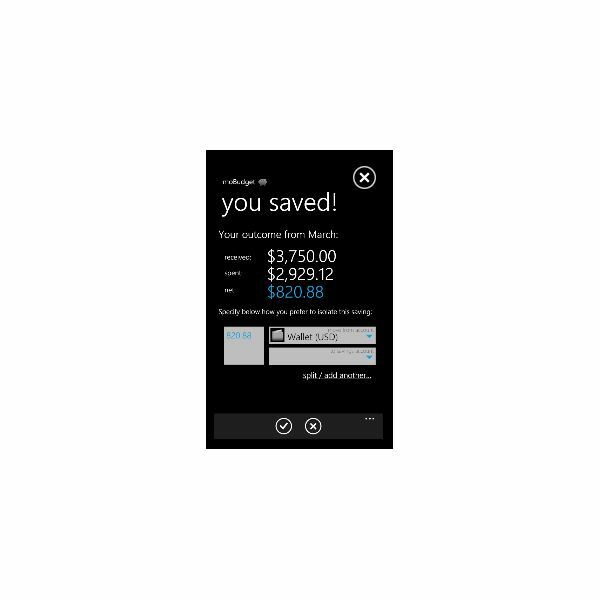 This popular personal finance app for Windows Phone 7 allows you to control and track incomings and outgoings, not to mention create useful reports that allow you to analyze your expenditure. Available for free, MoneyManager supports over 140 currencies and as such can be used in most territories. It offers backup and restore tools, a security PIN and customizable reports. A PRO version of MoneyManager is also available which creates reports in Excel, PDF and CSV formats and features an exchange rate calculator. Note that there are several apps with a similar or identical name – this particular one is a highly-rated app by Punit Gashani. Also available is My Budget. It offers an easy way to balance your books with support for multiple accounts all wrapped up in the stunning Metro UI found on most Windows Phone applications. Receipts and transaction categories make My Budget an excellent mobile bookkeeping solution that also allows you to apply a spending limit to your account and tracks expenses. One particularly useful feature in My Budget is the inclusion of live tile notifications, and the app also features 85 currencies and a useful passcode protection system to prevent unauthorized use. Available from the Marketplace for just 99 cents, a free version of My Budget is also available, with stripped-down features. 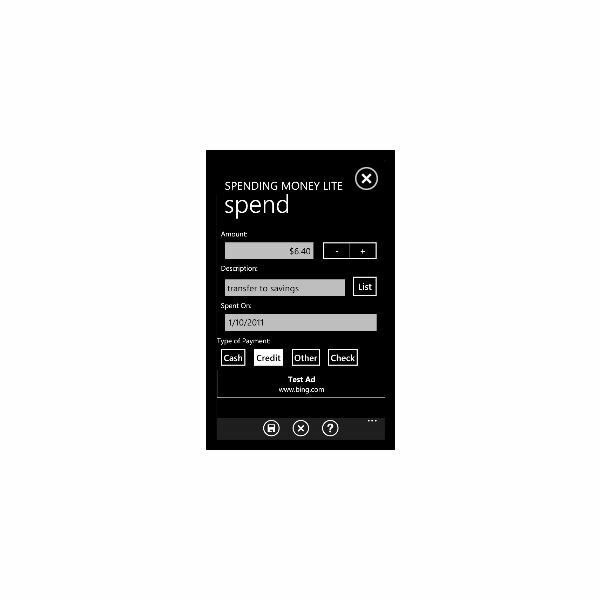 Available for $1.49 in the Windows Phone Marketplace, moBudget features a payment tracking tool, fast input and “live” balance updates and the ability to record your bank account usage (note that these features are calculated, rather than synced with your bank). What makes this app stand out, however, is the ability to create targets and achievements, such as paying off a debt or reaching a particular amount of savings. This helps to make managing your money fun rather than something to do when your car insurance costs go up. A “lite” version of moBudget is also available; this free version offers a stripped-down selection of features. Further details can be found at https://jdbp.mobi/mobudget. Taking a slightly different approach to mobile money management apps is Spending Money Lite, which requires you to begin by entering your salary and payday date and then add all expenditure as the month progresses. The app will then help you to stay on target and within the constraints of your budget – pretty cool! Spending labels on the statistics view will let you see how much is being spent, and multiple accounts can be managed with this app – useful if you’re keeping tabs on a colleague or partner. Spending Money has both free and full versions available, with minor differences between them. At the end of the day, it is just money, after all – which is why you should probably manage your expenses, monitor your transaction history and create reports using the Just Money app! Available for just 99 cents, Just Money can also be downloaded as a free trial, although this is limited to 10 transactions. With an attractive user interface and built in calendar, Just Money is easy to use and also offers a useful summary “dashboard” screen. Note that this app requires an Internet connection and access to location services (GPS, cell tower triangulation). Manage Money on the Move! Keeping tabs on your finances is important whatever you're doing, and thankfully these mobile apps allow you to do it on the move! Windows Phone 7 isn’t short of good quality mobile money management apps, but separating the wheat from the chaff can be difficult. Fortunately if you stick to the choices listed here you will find that keeping on top of your income and outgoings is made remarkably simple! All screenshots and references from the Windows Phone Marketplace.